1. The installation and construction personnel should have an understanding of the structure, performance and technical requirements of the impact crusher, and determine the appropriate installation process according to the specific conditions of the equipment. 2. At the installation site, hoisting equipment with sufficient lifting capacity is provided. Carefully check the reserved space of the equipment foundation and the coordinate position of the anchor bolt reserved hole to make it conform to the general plan of the equipment and the relevant basic design data. The vertical and horizontal basic coordinates (longitudinal and transverse curves) of the equipment are the center line of the equipment and the rotor axis line, and the difference between the center position of each reserved space and the anchor bolt reserved hole shall not exceed ± 10 mm. 3. The vibration absorbing material should be filled between the equipment and the foundation to prevent the equipment foundation from being weak after the formal production, which will affect the progress of the project. 4. When installing the machine body, the machine face should be flat, and the intersections between the machine body and the foundation should not leak dust. The anchor bolts should be tightened repeatedly, and there should be enough space in the lower part of the foundation for the installation of transportation equipment and equipment maintenance. 5. After the motor of the impact crusher is installed, it should be equipped with a transmission belt cover according to the actual situation of the installation. 6. There are sometimes radial cross-over gaps on the rotor. Therefore, the gap width between the counter-rack and the plate must be no less than 20mm after the first use of the new machine to ensure that the plate and the rear frame do not collide. 7. The gap between the counter plate and the plate hammer should be gradually reduced according to the work requirements. It is recommended to use several rotations of the hand rotating rotor after adjustment to check whether there is collision. After adjustment, lock the sleeve nut to prevent the counter plate from sliding down and colliding with the plate hammer. 8. 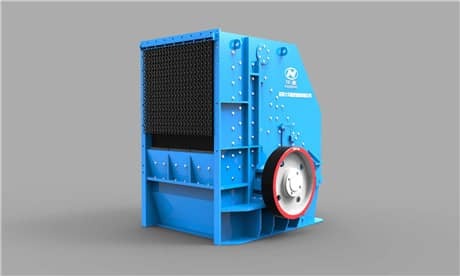 The outlet of the impact crusher is in the lower part, the installation height and how to cooperate with the feeding and discharging devices, all should be considered in the installation process.